Last week we hot-footed it up the A23, past London and on to Oxford. 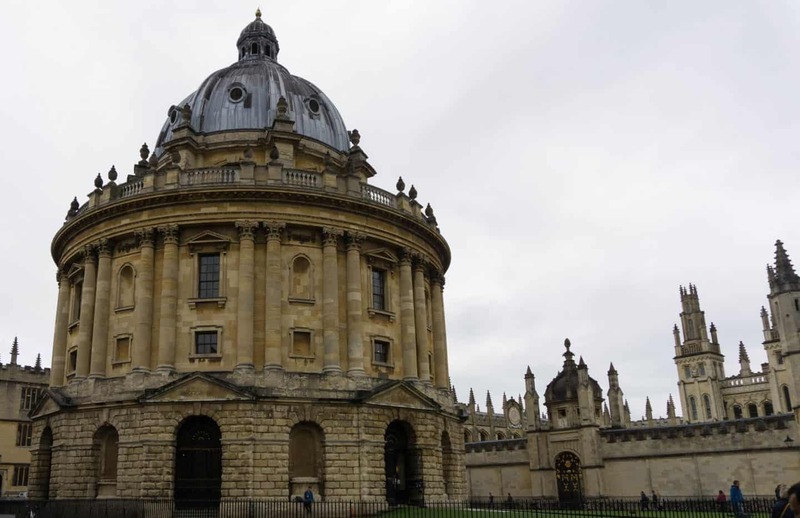 Oxford is a city that I have always wanted to explore, I have vague recollections of visiting it as a young teenager on a day out with my Dad but I honestly can’t remember what we did or where we went! 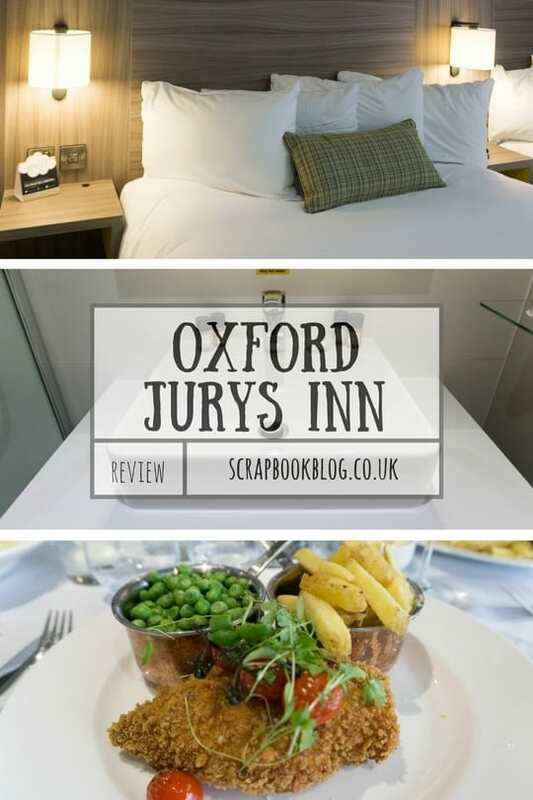 I’ve read a few books based in Oxford and of course recognise many of the stunning college buildings from films and TV shows but I wanted to visit as a family, so the Jurys Inn was the perfect place to base ourselves to explore it. We took the scenic route there, which took us through Henley and along the winding path of the Thames into Oxford, where we pulled up at The Jurys Inn hotel just as the heavens opened, talk about good timing! After we’d prised the kids away from all the comfy sofas in the lounge area we were checked in with a smile and a lovely welcome despite arriving at the same time as a coach full of people! In no time at all we were heading to our room for a well deserved cup of tea (me!) and CBeebies (them!) 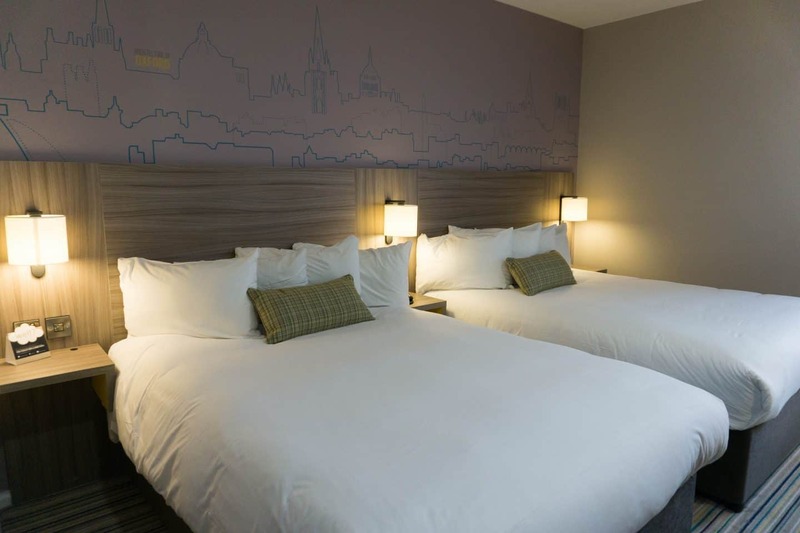 Our room was well sized with two double beds, a funky Oxford skyline graphic print along the wall, a big desk area and soft lighting. 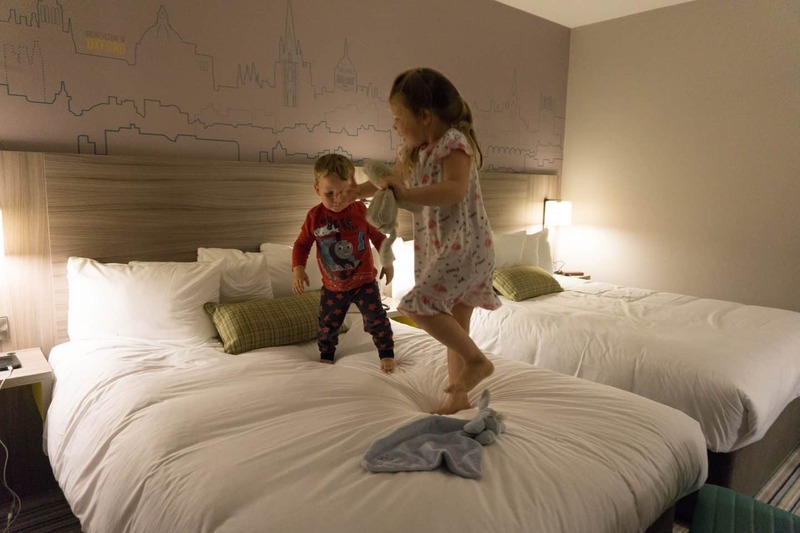 The kids both went into hyperactive mode; opening all the drawers, turning all the lights on and leaping about on the beds. I love the sheer joy being in a hotel brings them! We hung up our bits, shoved things into drawers (plenty of them – makes a nice change!) and then headed off for a walk as the rain had stopped. 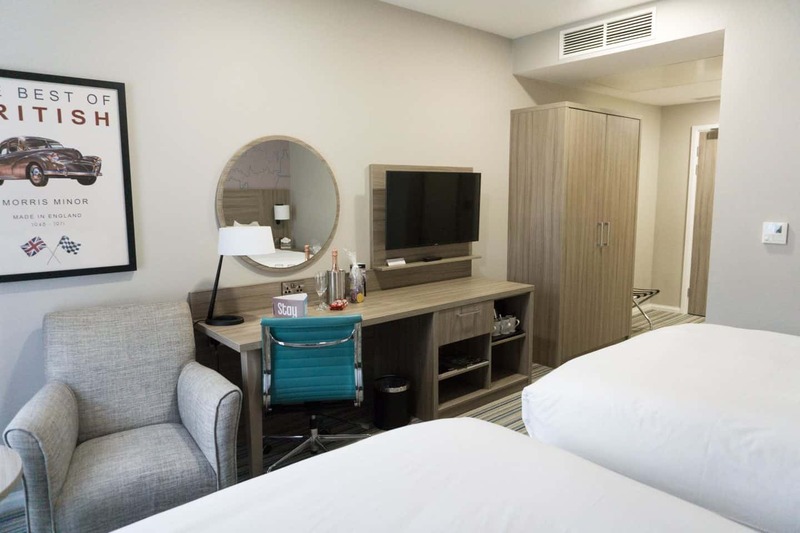 The hotel is located at the top of the city, with great public transport links and a free car park, but being on the outskirts meant that we could go exploring in the country by just stepping out of the hotel and turning left! We walked over a bridge with narrow boats on, past a field of grazing cows and on through the village of Wolvercote, finally stopping for a drink at The Trout. It’s a stunning old pub on the riverside, with a pet peacock just strutting about around the tables outside on the terrace. There’s a little wooden bridge over to gardens on the other side, where Arlo spotted a lion (thankfully just a statue!) but it was a lovely reminder of how picturesque Oxford is and it left me itching to explore the next day! Back at the hotel we worked out who was going to be sleeping where, popped a few spare pillows on the floor between the beds in case Arlo rolled out (which he did, as expected and actually slept there for most of the night quite happily) and got a great nights sleep. Both Sam and I tend to listen to podcasts to drift of to sleep, and were over joyed to find not only plug sockets next to the beds, but ones with USB sockets so no need to faff with adaptors, genius! In the morning we woke oursleves under the splendid rainfall shower head in the walk in shower, which was spacious enough for me and both kids to use at the same time! There was definitely room for a bath though, so it was a shame there wasn’t one and I love a good soak! Once we were dressed we headed off for breakfast. 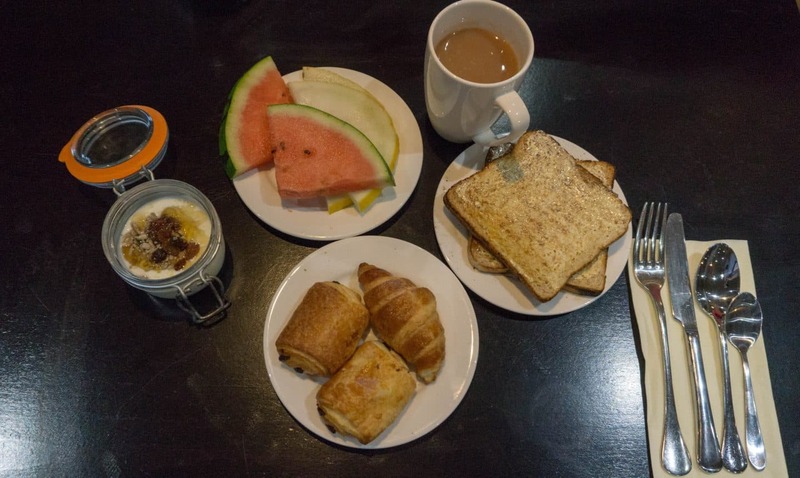 The restaurant is pretty big, with three defined eating areas to choose from, but as it was a buffet we chose to sit near the food, to ensure we could keep ourselves well stocked with cereal, croissants, smoothies, cups of tea and of course a full English breakfast! Everything was laid out well and replenished quickly, even though there was a large tour group eating at the same time as us. The kids enjoyed coco pops (we’re were on holiday after all!) and smoothies in cute little milk bottles and I had the full English followed by some fruit. Once we were full we headed off into Oxford to explore, leaving our car safely in the hotel car park and taking the bus in as it was a lot cheaper than using a city centre car park, and taking the bus is still an adventure when you’re a two year old! 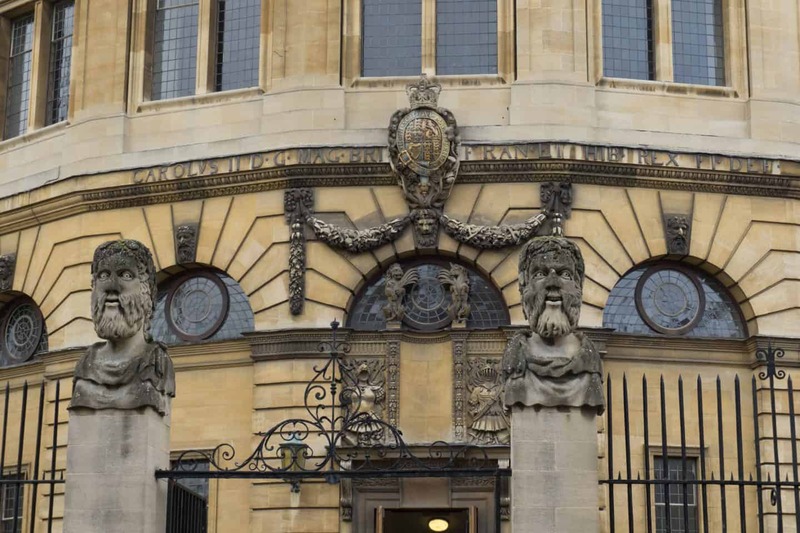 We had a really lovely morning wandering around looking at all the gorgeous structures, steeped in history and oozing tradition, my favourites were the ‘Bridge of Sighs’, the Sheldonian Theatre surrounded by stone heads atop pillars, and the Radcliffe Camera- actually its a library. 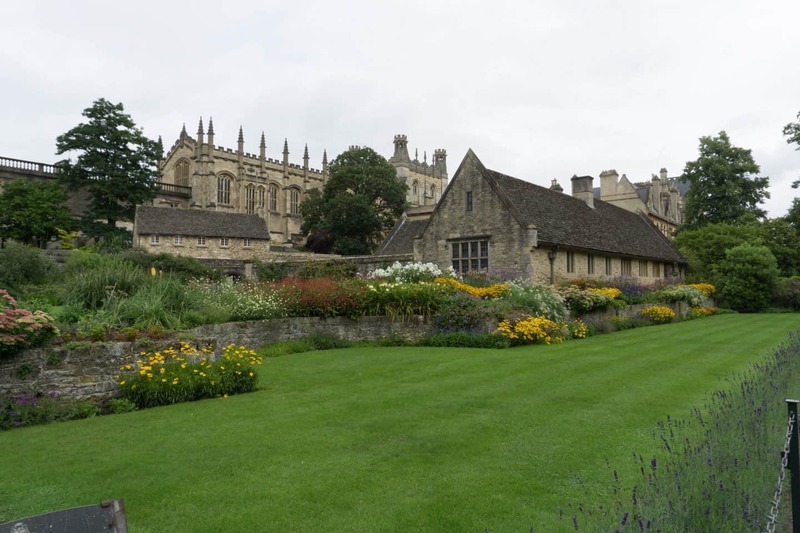 We could sneak peeks through railings at the manicured lawns of the college greens and hear snippets of stories from the numerous guides leading packs of tourists about. 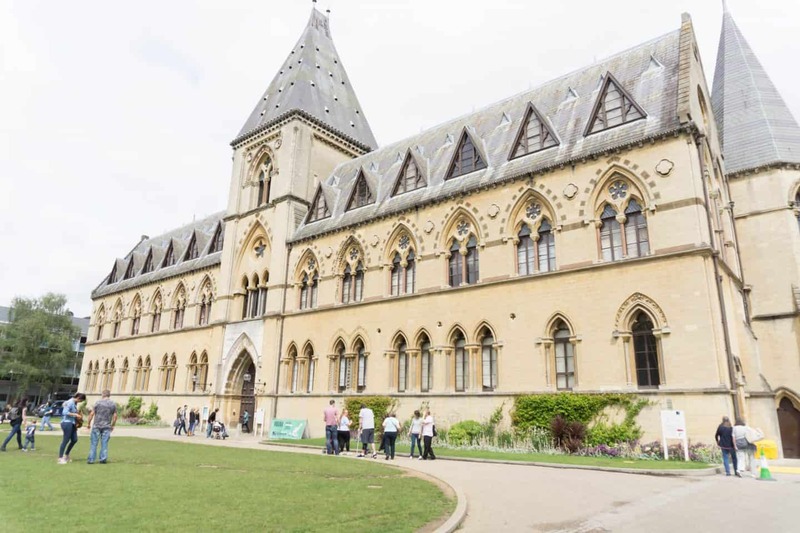 It then started to drizzle so we headed off to the Oxford Museum of Natural History and the Pitt Rivers museum at the back. Sam spent a lot of time answering Athena’s numerous questions and I spent a lot of time trying to stop Arlo from touching dinosaur feet and various other things that he wasn’t mean to touch! 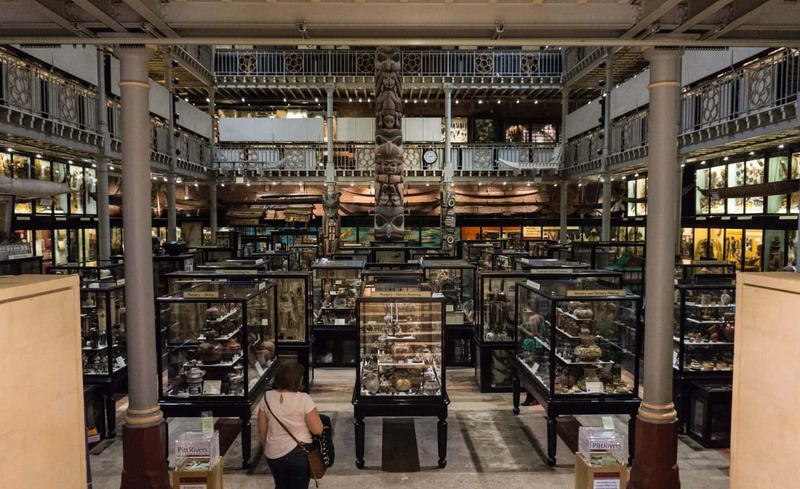 A tip though if you do visit is that all the wooden drawers around the outside of the museum hall open, which means there is SO much to look at! There were tables set up with kids activities, so we all made some Dodo Feet before heading in to look at the artifacts in the Pitt Rivers Museum, though neither of the kids liked the masks, declaring them scary! There were so many cabinets chock full of amazing things, from all over the world, I’m already wanting to come back in a few years when the kids have longer attention spans so we can really explore more! By mid afternoon the kids were getting a bit restless, so we took a little stroll around Oxfords oldest (and independent) department store Boswells, which has been open since 1738! That’s almost unthinkably old, for a shop. It still had a lovely traditional feeling inside but stocked all the modern brands you’d expect, we had a wander around and then refilled our hungry bellies at the tea room. Refuelled and refreshed, we walked up to take a look at the Castle and Christ Church Cathedral gardens before catching the bus back to the hotel for a little rest before dinner! 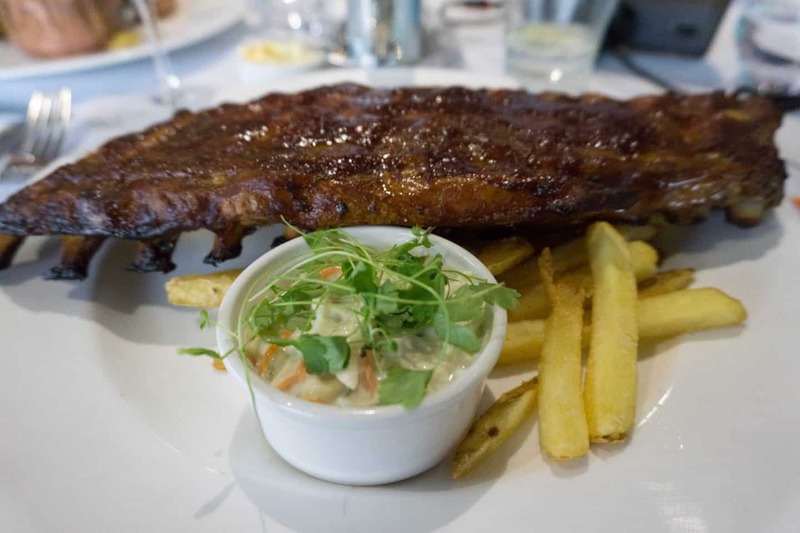 Dinner was a proper treat as the Jurys Inn hotel in Oxford is home to Marco Pierre White’s Steakhouse. 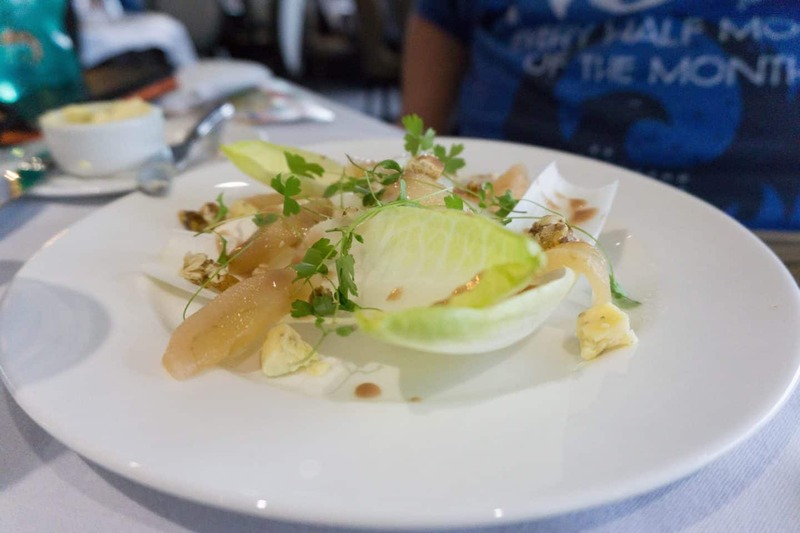 With a huge range of dishes on the menu and a great wine list to accompany it we’d been looking forward to dinner since breakfast, and we weren’t disappointed! 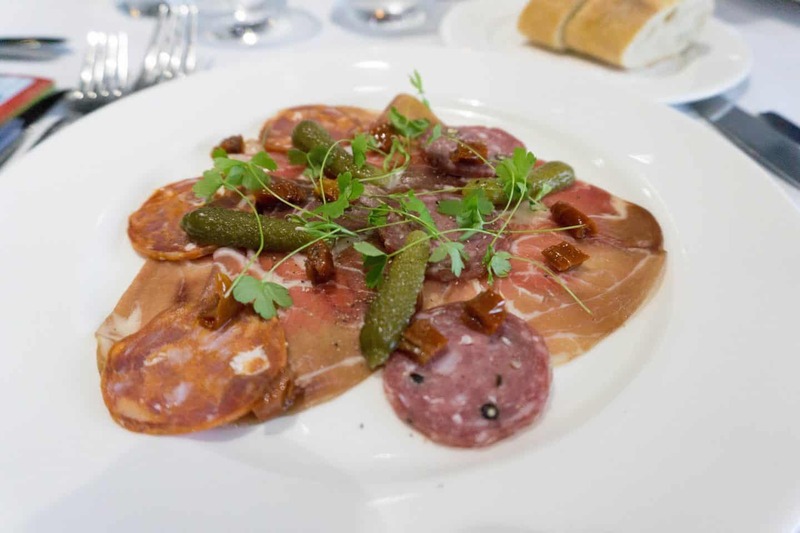 For our first course I had the Somerset Charcuterie which was a delicious mix of sliced meats and pickles, and Sam had the Pear & Stilton Salad, and said the flavour of each complimented each other perfectly. 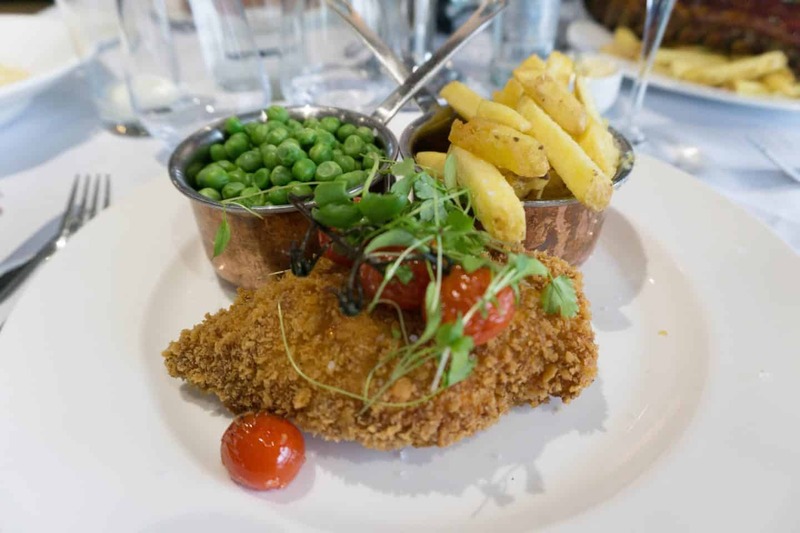 For our main course I had the Classic Chicken Kiev, which came with peas, crispy chips and tomatoes on the vine. Delicately coated with a breadcrumbs this was a generous portion of garlicky goodness! The presentation was perfect, with two mini copper pans holding my veg! Sams ribs were so good he wouldn’t share them, which I thought was wholly unfair but then I didn’t share my dinner either! The waiting team were really on the ball, despite the restaurant being completely full by the time we got our mains! The kids were kept happy with the colouring packs, which were way more than just a few crayons and a bit of paper! They had games in, counters and dice and all sorts! 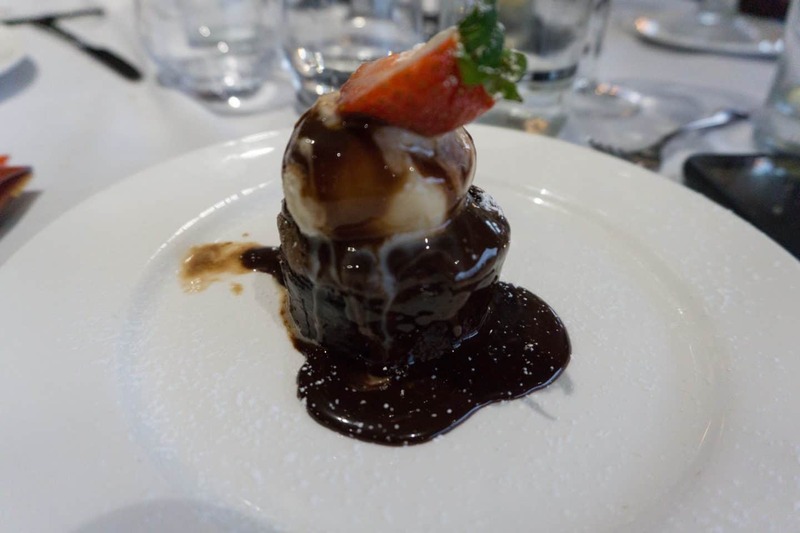 Even their menu could be coloured in, we really weren’t expecting a ‘proper’ restaurant to cater so well for smaller diners, so it was a lovely surprise, and they tucked into their sausages and Macaroni cheese with glee, and practically devoured their brownie puddings! In fact I had the grown up sized portion of Brownies too after our waitress recommended it when I couldn’t decide what to go for, and I am so glad she did! They were heavenly! Just the right texture and not too sweet! Sam made quick work of his Banana and Caramel mess, a modern take on an old favourite with plenty of Chantilly cream and meringue! Now if we’d not had the kids with us we would have retired into the comfy bar area for a cocktail or three, but the little darlings were getting restless so we took another walk down to the river to watch the boats and trains go by, and ‘moo’ at the cows before heading back to the hotel for a cup of tea before sinking our heads into the fluffy pillows! In the morning we hit the breakfast buffet again, I was a little healthier on the second morning! Then as the kids had been pestering me to take them swimming since we arrived I thought I better do just that before we left! The Jurys Inn in Oxford has a Rejuvenate leisure club on site, with a splash pool, sauna, steam room and a gym. It was a lovely added surprise, completely free for hotel guests and children were welcome! We had a splash about in the pool where Athena spent her time alternating between doggy paddling and bumping down the steps, until another little girl arrived and they made friends! Arlo is just perfectly happy to float about with his arm bands on and the pool was the right size for me to easily keep an eye on both of them at the same time, a rarity! Sam had conveniently forgotten his swimming trunks so I couldn’t leave the kids for a little sauna session but I will make sure he has them next time so I don’t miss out again! After a quick hair drying session in the changing rooms (which were as clean as a whistle, so rare for gym/pool facilities!) we packed our bags up, waved good by to the lovely receptionists and went on our way! As we drove through Henley on the way up we decided it looked like a nice place to explore, so we stopped there on the way home, it’s actually only about 35 minutes away from Oxford by car and is so picturesque! We found the most adorable old shop selling hundreds of proper teddy bears, and a really nice independent toy shop over the road, which was a stroke of luck as all Arlo wanted was a car, which the teddy shop didn’t sell! 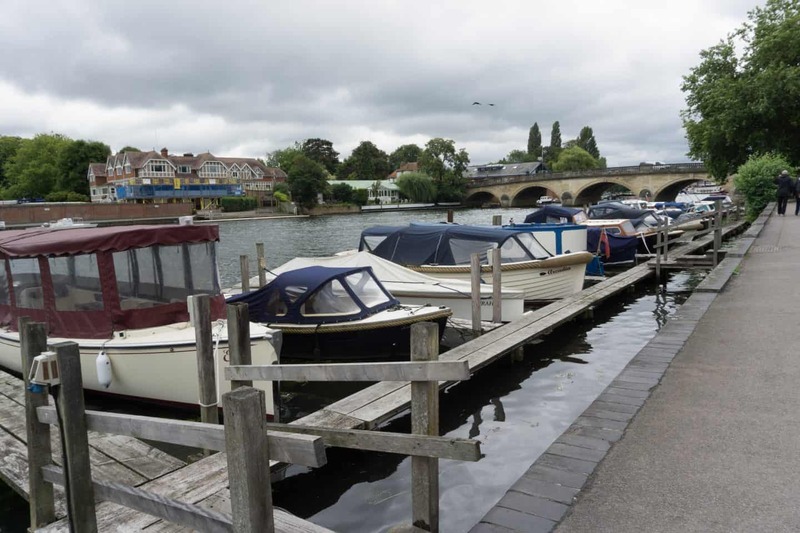 It was a bit of a dull day but the river still had boats on, we stood on the bridge for a while so the kids would watch the boats, and so Sam and I could dream about owning one, or one of the gorgeous riverside properties! A final stop for hot chocolates and toasted tea cakes at The Chocolate Cafe (yep, as good as it sounds!) before heading back down to the coast and home… But rather excitingly we’re exploring our own home city of Brighton this weekend, so stay tuned! 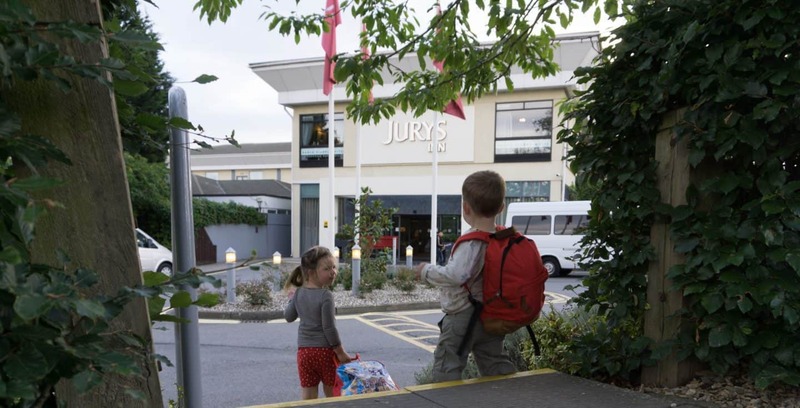 There are Jurys Inn Hotels across the UK and Ireland, you can view all the hotel locations here, and they’re perfect for families, couples or even on business! I loved the huge variety of guests at the hotel, the staff were so lovely and made a point of talking to the kids as well as us, and although we managed to misplace our room card not once but twice it was always replaced with a smile! 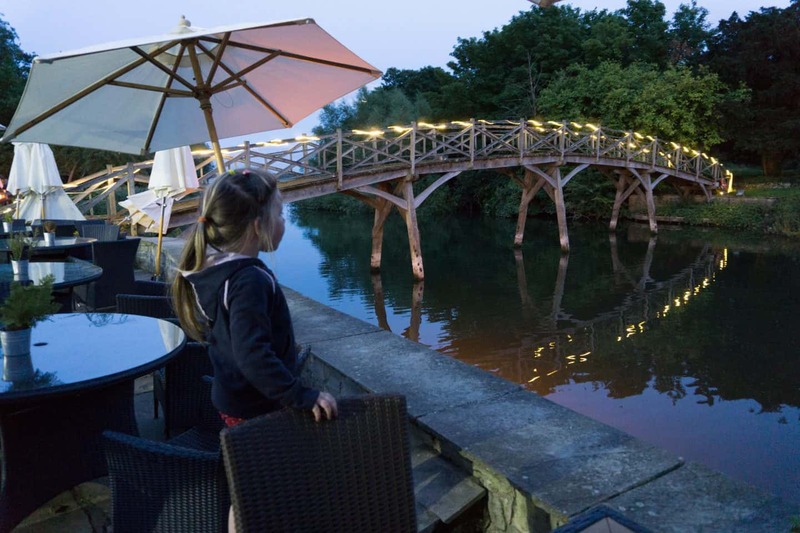 The addition of the leisure club has made this hotel top of my list for future stays as its proximity to the M40 makes it a perfect stop over on long journeys, or to meet our family who live at the other end of the country as a mid point! Our stay at the Jurys Inn in Oxford was complimentary. All words, opinions and images are my own. Travel: There’s more to France than you think! What a fabulous trip you had? I’m so glad you made it to the museum, it’s great fun in there for kids isn’t it? 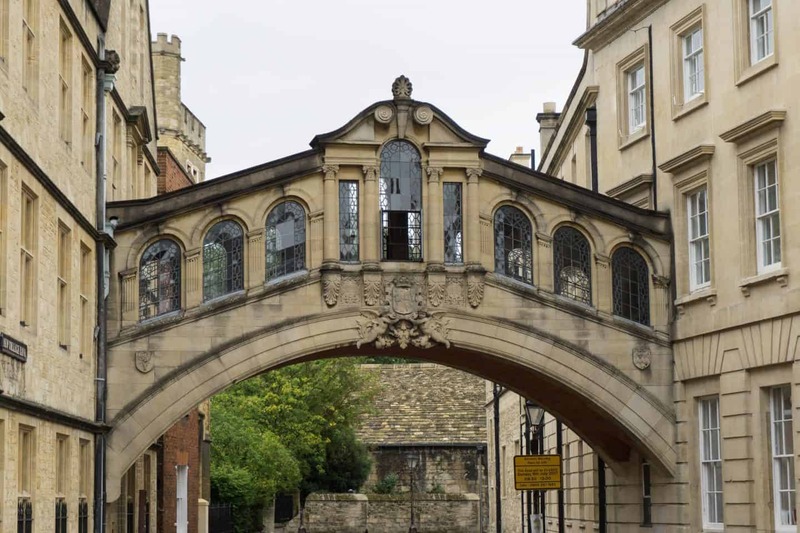 Oh I’m SO jealous I really want to explore oxford now too! 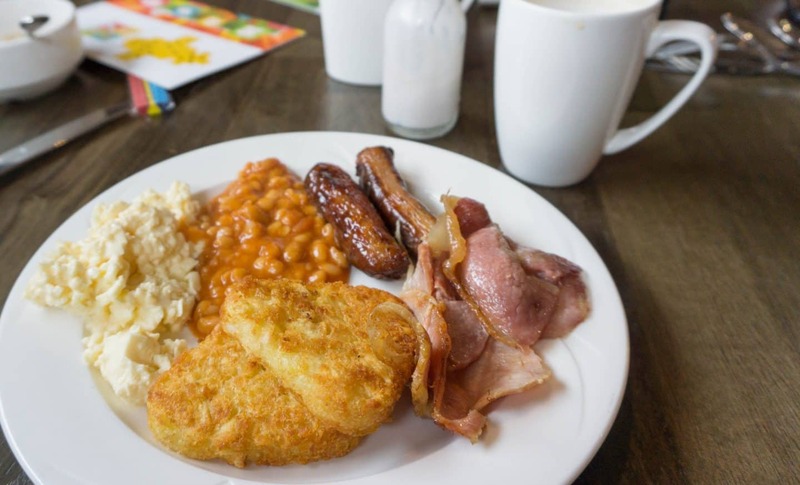 The food looks epic as well – a buffet style breakfast makes life so much easier with kids. I’ve never stayed in a Jury’s Inn for some reason. 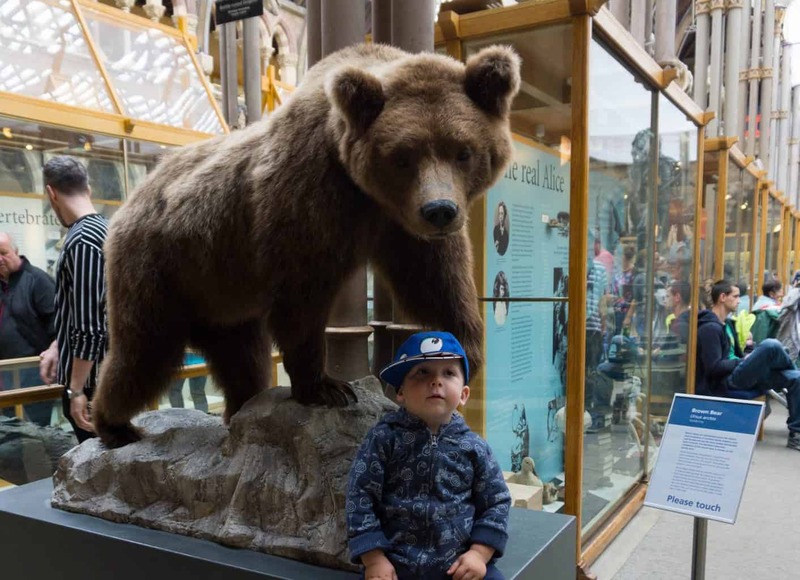 That room looks lovely and I love Oxford, we went to the museum of natural history when we visited before and the boys love it. Sounds like you had an amazing family time in Oxford. I was there few weeks ago and really enjoyed exploring the university city. The punting was fab!